“On behalf of RxSafe, I'd like to extend our heartfelt congratulations to Ben McNabb, who is so deserving of this award,” said William Holmes, president and CEO of RxSafe. SAN DIEGO, CA, October 08, 2018 — For the second straight year, an RxSafe, LLC customer has won the Outstanding Adherence Practitioner Award from the National Community Pharmacists Association (NCPA). 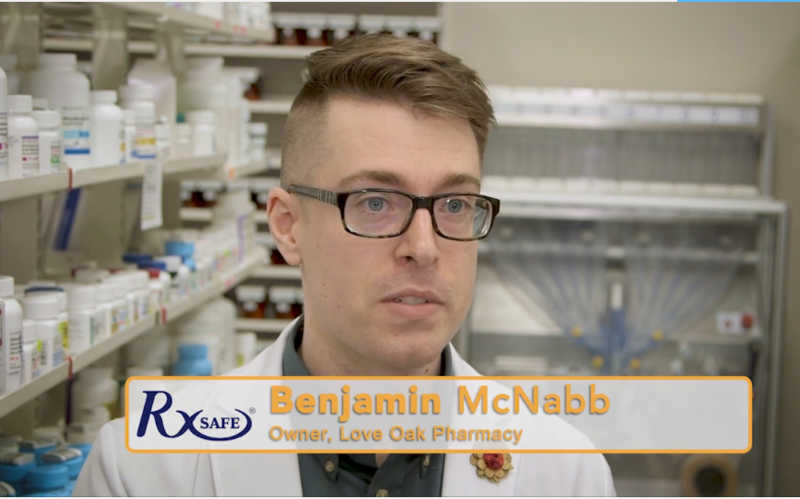 Dr. Benjamin McNabb, pharmacist and owner of Love Oak Pharmacy in Texas, received the award Sunday at the NCPA 2018 20th Annual Convention in Boston. • promotion of availability and value of pharmacy-based adherence services. McNabb's success improving patient adherence at Love Oak Pharmacy is proven by the numbers. From a standing start with no existing adherence program, Ben grew his patient population using adherence packaging to 200 patients in 2016, and increased that by 100 percent to 400 patients by the end of 2017. Love Oak's CMS star rating rose from three to five during that time. The 2017 winner of the NCPA's Outstanding Adherence Practitioner Award was another RxSafe customer: Andrew Finney, PharmD, owner of Perkins Drugs in Tennessee. NCPA will make a donation of $1,000 to a school or college of pharmacy of McNabb's choice. He received his PharmD from the University of Texas at Austin. RxSafe is the leader in automated, high-density robotic storage and retrieval technologies for independent pharmacies. Our flagship RxSafe system enables pharmacies to take control of their inventory management, enhance patient safety, increase narcotics security, and improve profitability. RxSafe's RapidPakRx adherence strip packaging technology enables pharmacies to custom package patient medications on demand. RapidPakRx produces multi-med pouches with unprecedented accuracy and efficiency, as well as the lowest consumables cost in the industry. For more information, visit www.rxsafe.com. To stay connected, follow RxSafe on Twitter, LinkedIn and Facebook.